Come on Mr Mayor…don’t just plant a tree, sow the seeds of change! He wears red trousers a lot. He played a significant and important role in the redevelopment of Bedminster’s Tobacco Factory. He wants every child in Bristol to plant a tree. Of these three statements one impresses me and causes me to think all is not lost; one has made me confine the wearing of my own pair of red trousers to when I’m gardening; and one of these statements really, really annoys me. I think it should be clear to most people that the red trousers issue is taken care of; I think the Tobacco Factory is great so that leaves us with statement three: he wants every child in Bristol to plant a tree. It was a couple of days after his election victory that Mr Ferguson addressed a room full of Head Teachers at the University of the West of England. Poor bugger, he was probably still hung over from celebrating but his PA had obviously said ‘Get on that stage Mr Mayor, this is an opportunity’. So he came on and I remember two feelings: slight surprise because close up his red trousers were actually tartan, but more than that I remember feeling a bit sorry for him. He seemed a bit flustered and who could blame him? He hadn’t talked that much about education before and suddenly here he was talking to a load of Head Teachers, I mean what was he meant to say? Turned out he did some crowd pleasing material on us all being heroes and then, in what I imagined was a stream of consciousness, he said that he wanted every child in Bristol to plant a tree. I quite naturally ignored this as did most people on my table. It was just a bit of fluff and nonsense designed to sound inspirational in a ‘children are the future of this planet and so are trees’ kind of way. It didn’t carry any weight, no we would forget about this idea. Put it at the back of the cupboard with the other ‘big’ ideas like building a solar powered snow plough and running a competition to find Bristol’s favourite soup. So imagine my surprise when I received an email asking me to sign up for the Mayor’s big scheme of getting every child in Bristol to plant a tree. Why? 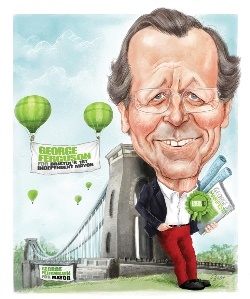 Will it make Bristol a green city? Will it provide a safe canopy for our children to walk under on their way to school? I don’t think it will. It might make Bristol a better shaded city in the summer months and it may encourage more tree climbing therein creating a more risk taking generation which could be a good thing but…I think that might be it. No, what really annoys me about this idea is that it is in danger of being really small minded and for a man who displayed such vision when saving such a culturally significant building as the beloved Tobacco Factory and who proudly wears red tartan trousers in public, this paper thin initiative is a massive disappointment. Education at this precise moment in time is not in the best of places and I would have thought that the proposed National Curriculum, which seems to be unifying all educators through their hatred of it, would be seen as the golden egg squeezed out from Gove’s massive egghole (urgh) to be picked up and capitalised on. Imagine a whole city turning its back on a badly formatted and politically engineered curriculum and instead creating something truly inspiring and meaningful for its children. A City Curriculum with local and global dimensions agreed upon by all educators and pushed forward by the city’s Mayor. A newly elected Mayor should seize this opportunity to engage with school leaders and play a part in developing something far greater than the sum of its parts. A city curriculum could truly lay the foundations that would allow an entire city becoming ‘outstanding’ based on any set of criteria from anybody’s score-book. Schools may not be able to do it on their own, they carry with them too much baggage, but with a leader or a figurehead to help facilitate the journey we could do it. The Mayor is in the correct neutral position to at least give it a try. Or…we could plant a tree and then get on with teaching 7 year olds about the house of Plantagenet. Your call Mr Mayor. Previous Article Aspiration Nation – or History Repeating?